Gulf Air, the Kingdom of Bahrain’s national carrier, has launched ‘Manage My Booking’, a new solution from ANIXE, a state-of-the-art internet booking engine supplier, to give clients a more personalized shopping experience. Nowadays, having the possibility to manage reservation details is ‘a must have’ in the flight-commerce industry but Gulf Air’s solution really stands out from the crowd. The main idea was to make it convenient, save passengers’ time and their nerves. Now Gulf Air’s passengers can check all their flight details in a one portal ‘Manage My Booking’. In line with ANIXE’s vision, the company’s aim is to provide the travel businesses with customer insights, personalization capabilities and boost sales power. ANIXE quote: “We’ve already rolled out ‘Manage My Booking’ facility over the last few weeks and the initial results are extremely positive. In just one week over 14,000 unique users logged into the portal. 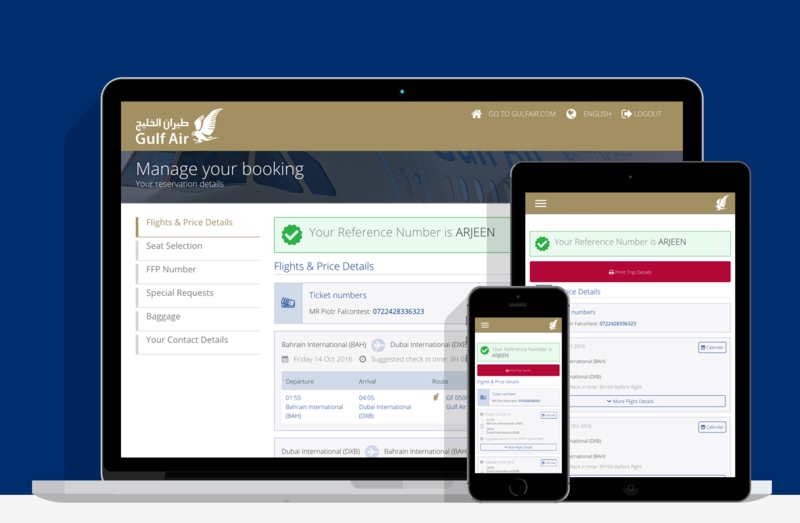 The enhanced Gulf Air platform boosts both clients and sales power by offering passengers wide possibilities to support their reservation online and decreasing the number of email inquiries and calls to the call center. ‘Manage My Booking’ helps to strongly support customer retention and improve the consumer decision journey by making it child’s play to use it and find reservation details”. ‘Manage My Booking’ drives passengers convenience at every step. No registration is needed to view and print contact or flight details as it all happens through the Passenger Name Record (PNR) and can be easily done anytime and anywhere. In the reservation center travelers can find information about check-in and baggage allowance, payment due date in the Pay Later option or download flight details directly into their Outlook Calendar or any other application on an IPhone or Android. Gulf Air’s passengers can choose from a plethora of meal types and ask for amenities for the disabled, visually or hearing impaired. The ‘Manage My Booking’ facility also supports clients from the Frequent Flyer Program, who can easily add their card number to collect miles. Thanks to seat selection, travelers can check out exactly where they are going be sitting during a flight on the plane. This open solution can be further developed with a seat map to allow choosing of a seat in one reservation flow. The customer experience has become increasingly more important over the years as more digital channels are competing for a customer’s attention. The ANIXE solution has been designed with a deeply customized look and feel to create a truly immersive experience using multiple channels. ANIXE also helped to develop a robust and engaging solution for Social Media channels. In a split second, the information about where we’re flying can be shared on our profile”.